I received this product for free to review, however my opinions are still my own. A few years back I suffered from a pretty serious case of insomnia – which was terrible for both my appearance, my mental health and basically every other aspect of my life. So believe me, sleep is one of the most important things if you want to look, feel and do your best! When Mediflow offered to sent me their Floating Comfort Pillow I was very intrigued. I already have a regular cotton pillow and a side sleeper gel foam pillow; but I had never heard of a water pillow. In the published article ‘Cervical Pain: A Comparison of Three Pillows‘, the authors found that water based pillows were found to reduce morning pain intensity, increased pain relief and an overall improved quality of sleep. Since I’m slowly recovering from a rotator cuff tear, this only made me more excited to sleep on this pillow. This is a great pillow – it’s like a waterbed for your head (but without all the weirdness of a waterbed). I really do feel like my head is floating – I don’t even really notice the water base part. The pillow seems to adapt to my shape and support my weight without me really even noticing. It is crazy comfortable! For the 5 days have been using only this pillow and have found that I am falling asleep faster, staying asleep throughout the night and waking out without any neck or shoulder pain. My spouse slept on it as well, said he really liked it — and I noticed that he didn’t snore when using this pillow (will take some more time to confirm if this is just a happy coincidence. The only inconvenient part of this pillow is having to full it up with the water. The instructions are clear in how to get out the air bubbles – but I still managed to spill water all over myself. I think it’s a 2 person job unless you are a very coordinated person. 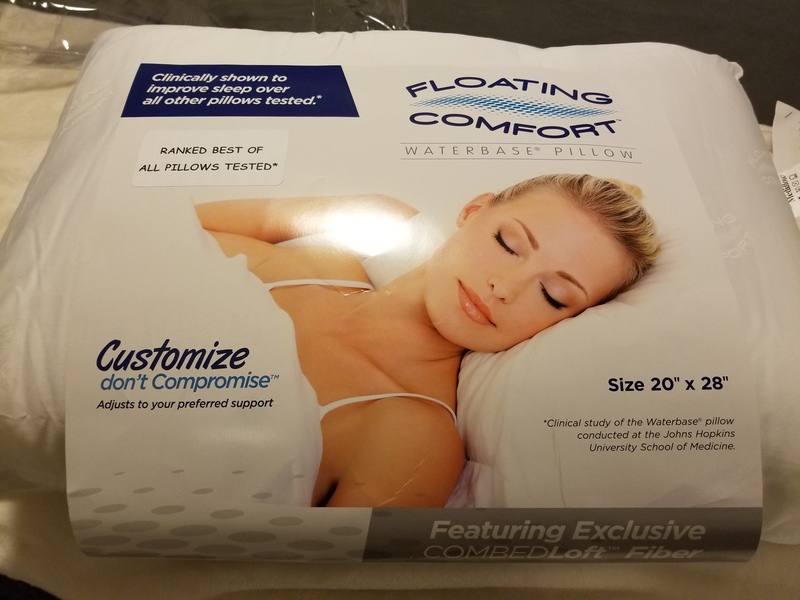 I am happy with this pillow and if you aren’t having the best sleep maybe you should think about checking a waterbased pillow out. Sleep is so important to our health (physical and mental) so it’s important to invest in the right rest products. Tell me, what do you need for a goodnight sleep? One lucky reader will win a Floating Comfort Pillow for themselves. Check out the Rafflecopter giveaway for more details. This entry was posted in Beauty and tagged beauty, health, healthy lifestyle, pillow, rest, sleep, water by maldham. Bookmark the permalink. I try to go to bed early. For a good nights sleep I need my white noise machine on and a soft blanket. I try to not use or watch any electronics an hour before bed. I infuse lavender and get plenty of rest. Turn the lights off etc. to slow down and relax. We sleep with a humidifier on. Being more comfortable on the neck area! Being more comfortable on the neck area by using extra pillows around my neck. And go to sleep earlier! I actually put on lavender lotion before bed. The nights I do it, I “think” I sleep a little better but reality is I have a 15 month old..
Use a soft & warm blanket! This sounds so interesting! Something I’ve never heard of!